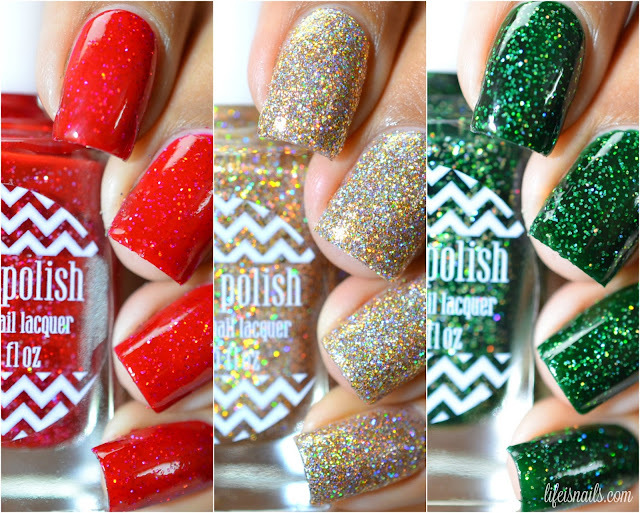 In this post, I will share with you the swatches of the second collection(Trio) from Painted Polish which I got along with the cozy collection and that is Happy Holo- days Trio. This Trio has everything for a holo lover like me!! Intense micro holo glitter, squishy jelly with holo glitters and on top of that these colors represent the Coming Christmas holiday so well!! I just love it!! This Trio came out in 2014 holiday season and will be retiring early new year so you better grab them before they go forever. Without further ado lets begin with the swatches! Ho Ho Ho-Lo - A stunning red jelly with silver holographic micro glitters in it. I just love the red color and when it comes with holo glitters in it, it feels like treasure on my nails! The formula was so good that I would have licked this polish off my nails. :P Dont you just love this red jelly holo?!! Shown here is 2 thin coat wth top coat. Painted Pines - An outstanding emerald green jelly with silver holographic micro glitters in it. The formula was like a dream, the application was super smooth. I said it in my previous post as well that I am not a fan of green, but this girl is changing her mind now, it's all because of how beautiful Lexi makes the green to look. It's all your fault Lexi!! :D.Shown here is 2 thin coat wth top coat. Blinded By Bubbly - A champagne gold holographic micro-glitter in a clear base. The glitters spread very easily to the entire nail. it was almost opaque in 2 coats but because I saw some spots left unfilled, I went with 3. This name suits this polish so well, my camera did go blind seeing its holo glory. I love it!! Even with low lighting, this beauty is so sparkly. Shown here is 3 thin coat wth top coat. I loved this trio so much that I feel like crying that this trio will be retiring very soon new year. The formula was outstanding, the application was smooth and the colors are perfect for this holiday season. I can't pick a favorite because I loved all the 3 equally. *The shop will close Friday 18th December, 15 for the holidays and will open early January 2016, So get your favorite polishes right now!! You can get this collection at Painted Polish online shop.